the first few months of you were probably the hardest of my life, but they were also the most fruitful. i've changed so much and in so many ways this year. i've grown up a lot, and i've worked so hard to make my life what it is right now. i know it's only going to get better in 2011.
i'll have an incredible husband by my side. i'll have a little niece or nephew to love and spoil. i'll make new friends and nurture the friendships i already have. i'll enjoy my family and continue to learn and grow and change and mature. next year is so full of hope and promise for me. i believe with all my heart that it's going to bring amazing changes. i can't wait to watch it all unfold and to take it on! i pray that this year brings you more blessings than you'll know what to do with. my little sister, ivy, and i couldn't think of the word for hourglass. as we were trying to figure it out, she exclaimed, "sand clock!" like she was convinced that that's what it was actually called. levi and i were talking before bed the other night, and he said, "without love, we're just really loud, obnoxious noises going somewhere to happen. i don't want to be a gong." ha! i know funny people. i'll remember all the words i've been forgetting over the last few months. i'll stop interrupting when people are speaking because i know i'll forget my thought if i wait for longer than 1/2 a second. i'll want to cook again. i'll have more time for blogging & reading blogs. i'll want to take pictures everywhere i go. i'll become an editing machine at work. i'll stop laying awake at night remembering all the things i still need to do. i'll look at magazines & read books again. i'll start doing the dishes again & will never again move piles of them to the floor to get them out of my way. i'll do laundry before i have to start drying off with a kitchen towel after showers. i'm not complaining at all. the last few weeks of wedding planning have actually been really fun....absolutely crazy, but fun. i love all the madness of planning. i love all the lists, all the running around trying to get things done, the hunt for the best possible deal, the constant brainstorming. but i will be relieved once it's all over. i can't wait to get back to a normal life. we can see our bedroom floor again because we did laundry for the first time in 2 months! this christmas was very different for me. we didn't have decorations or a tree. we didn't give each other presents. we didn't send out christmas cards or make gingerbread houses or bake christmas cookies. it lacked all of the anticipation & buildup of excitement that christmas usually brings me. - frantic last minute shopping at closing time. - dinner in the lounge at hof's hut (levi & i have a tradition of eating at restaurants frequented by the older generation on christmas eve). - an up-all-night slumber party on our living room floor where we watched three cheesy movies and didn't sleep a wink. - christmas morning at my mom's house with creepy victorian masks and fresh muffins. each person's mask eerily suited them. - brunch at my aunt's where i broke out in a crazy fit of laughter brought on by my lack of sleep. - a 6 hour nap 'til 8:00 at night. - and baking chocolate chip cookies at midnight. yesterday, levi & i received the sweetest wedding gift. someone mailed a card with a very generous cashier's check in it anonymously to levi's salon. the words they wrote to us and their selfless generosity brought tears to both our eyes. it was incredible, and i praise God for this person's gift. i know God will bless them for their generosity and kindness. i hope they know how grateful we are and how much their gift means to us. i love that kindness is designed to be reciprocal and contagious. when someone blesses me, i am encouraged and inspired to bless others. it sounds cheesy...a lot like that pay it forward movie...but it's so true. no matter what happens and no matter where we spend the money we were given, i want to hold onto the gratitude it created. on that note, i would like to wish you and yours a very very happy christmas filled with love, peace, and joy. enjoy this weekend & all the time with your family!! i think this photo is incredible. levi & our friend, will, unintentionally dressed very similarly (this seems to happen a lot) at the party we went to over the weekend. this time, they look like they belong in a boy band together... they'd make a good looking boy band! p.s. did you notice levi's wedding ring in this photo?? we got them back that night at the party, and he wouldn't take it off. it is beautiful. he has since taken it off, but he's counting down the days 'til he can put it back on again. levi & i went to a really fun christmas party over the weekend. i love this group of people, and i love dressing up for a party. tie: structure...back when structure still existed! ha! i'm including levi on my next outfit post too! stay tuned. last week, levi & i went to the mecca of candy. oh my gosh, you guys. this place was insane. it was a HUGE warehouse filled to the ceiling with candy. every kind of candy. in every color. all wholesale. we came home with 75 pounds of candy! i think that maybe we should live there. i received the sweetest package on saturday from levi's cousin, robin. i'm sure you already know how thrilled i was! wasn't that the sweetest, most thoughtful gift? it definitely made my day. i'm going to find a good use for the beautiful box they came in & treasure it forever. preferably with a coffee, an orange danish, & the one you love. our friend, ed, saw our wedding rings at the jeweler's (he works in jewelry so he was there on business). he called levi to give him an ETA and used the f-word to describe how beautiful my ring looks. this pretty much made my entire week! i get a little shaky with excitement when i think about it. i CAN'T WAIT to see both of our rings!!!! in other news, i love levi. i know this is stating the obvious, but he's just really incredible. he is the best sounding board in the world. he helps me sort out my feelings and make decisions. he gives me great advice. he always supports me. he surprises me with little treats and things he knows i would like. he makes me feel special. he has stepped up SO much with wedding planning. he actually takes care of things without me having to ask him!!! planning things! and this is totally out of his element. he is not naturally inclined to take care of these types of chores, but he makes the effort because he loves me. he makes himself remember to do these things. it means so much more to me than he'll ever understand. he loves me so much more than i realize. sometimes i feel like he must love me more than i love him. he's better at showing me his love anyway. i'm so lucky to be this loved. i don't deserve it in any way. levi dropped my toothbrush in the toilet the other night. we laughed. i think this is week ten of my getting dressed series, but i'm tired of counting, so i'm going to stop now! i bought this shirt specifically to wear with my gorgeous grey lace skirt from j.crew (purchased with my store credit from my triumphant return that you can read about here). i think it's the perfect color to go with the pretty shade of grey. i also bought it because it was only $15! i have no idea where i got the shoes. i've had them for years, and the label is worn off. i know i originally said that i would only feature non-fashion bloggers in this series, but i had to make an exception this week so that i could introduce you to kendi. kendi writes a blog called kendi everyday where she shares daily outfits. she just finished her fall 30 for 3o remix (you take 30 items of clothing and create 30 outfits with them for 30, or more, days). you can see a summary of her fall remix here. check it out. it's pretty awesome what she's done with the same 30 pieces. 1. she's hilarious. i love her "blog voice." she is the only fashion blogger whose posts i actually read. i usually just look at the pictures. 2. i think she loves j.crew as much as i do. 3. i know i said two reasons, but i'm adding a third because i can. the way she dresses really inspires me....especially her mastery of knee highs under boots. i don't think i've ever seen it done better. isn't she pretty?? i looooove that dress & this outfit! so cute. 1. where did you wear this outfit? I wore this outfit on a Saturday at my parents house. B and I went shopping and to a few coffee shops and book stores. Now that I think about it, it might have been the perfect day. 2. where are your favorite places to shop? favorite online stores? Oh gosh, so many places! I am a mall-rat at heart so my favorite stores are J.Crew, Gap, Loft and Target. If only those stores existed, I'd be fine. I really like to find deals on Amazon (as weird as that sounds). You can find some amazing sales on shoes online, which is where I buy most of mine. Amazon and Piperlime are my two favorite sites. 3. do you have a style icon? I love the way Rachel Bilson pulls off refined casual -- she does it like no other. And of course I like every other girl in the world have a total style crush on Zooey D. Sigh. Clothes in general. I love shopping, maybe too much? So shopping for anything is so much fun. I love a good sale, it makes shopping that much more fun if you can get a good deal. I don't love swimsuit shopping though. It's always a bit of a drag trying to find the right one, and when I do it's always more than I want to pay! 5. is there anything you would love to wear, but are timid to try? I really actually love those fur vests (even though I said I wouldn't go there on my blog). I just don't know if it would make sense for me to have one, here in south Texas. If someone gave it to me as a gift or if I got one on ridiculous sale, I'd be okay with owning one though. 1. if your style spoke a language, what would it be? 2. what cartoon character best reflects your sense of style? I'm going to have to go with Minnie Mouse on this one! I mean she's always in heels, that's my kind of girl. 3. what time period would you love to have dressed in? The 1920's (this Great Gatsby!) or the 1960's. I love the silhouettes of both eras. i hope you had fun meeting kendi! you can get to know here better here. i just thought you should know that we fold 2,000 doilies on sunday with the help of our friends and family. they're for a little wedding décor project we're doing. we had everyone over for a little doily-folding party, and it was actually really fun! i made the most delicious spinach artichoke dip. my mom brought all kinds of yummy snacks over. the time flew by just chatting, snacking, and folding. if you have a big DIY project planned for your wedding, i highly recommend asking for help and throwing a simple party to get the work done. something i've learned during this planning process is that people want to help. they want to be included! it feels good to help your friends! i hope that our guests who have helped us feel a sense of pride when they see how our wedding comes together. i hope they feel good about the part they played, and i hope they know how much we appreciate them. it's making me miss the rain we had last weekend. i love rain. it's my favorite weather. levi loves it too. it reminds him of portland (where he grew up). these photos are from our walk to levi's work christmas party....it was on a boat...in the rain. it was interesting. up on the top deck, we got pelted with insane rain. the crazy wind that accompanied the rain on the water almost ripped our umbrellas out of our hands. we went back to the lower deck with soaking tights and socks. at least it was an adventure! and i did say i loved rain. update: i found some!!!! such a relief. i am having the hardest time finding anyone who makes suspenders for little boys on etsy. black and white gingham or checks would work too (not anything that looks like racing flag checks though). 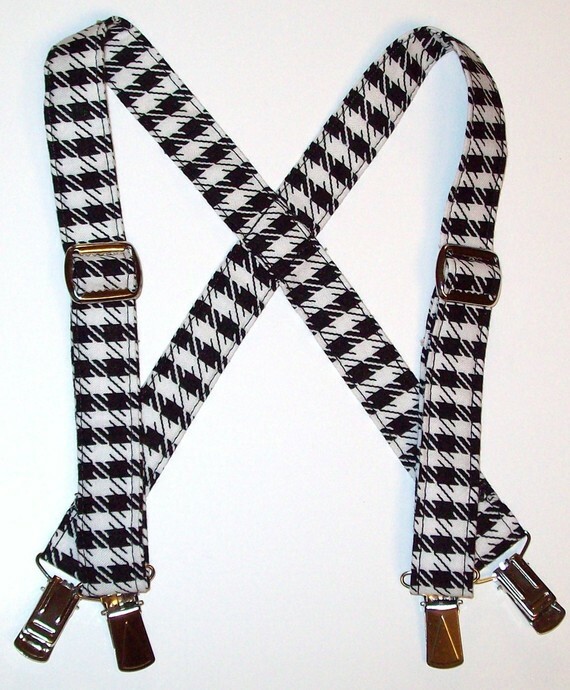 do you know of any sellers who make suspenders for boys? do YOU make suspenders for boys? please let me know! i'm starting to get to the point of desperation. last week, at this time, we were heading to downtown LA to take care of our wedding rings. and this week, we're heading back to downtown LA to get some supplies for wedding décor. wish us luck! i have zero holiday spirit this year. levi and i aren't getting a tree. we aren't giving each other presents. we aren't sending out christmas cards. no gingerbread houses. we're not throwing a christmas party. i won't be baking cookies and giving them out. we probably won't put up lights or hang our stockings. i don't know if i'll put up any of my decorations. it's just not happening this year! it's not that i feel i should do all these things or that i think those things define what christmas is...it's just that i really like those things, and i wish i wanted to do them! i guess it's understandable. something had to give. as much as i think i can do everything, i really can't. i'm only one woman. i can't force myself to feel excited for christmas when i'm finally starting to find some excitement within myself for this wedding. in retrospect, planning a wedding that takes place immediately after the holidays probably wasn't my most brilliant idea...but it made sense at the time. one thing we have done to foster some holiday spirit this year was volunteer with operation christmas child. it was awesome. we spent four hours sorting through christmas boxes that will be delivered to children in need all over the world. if you have a processing center near you, i highly recommend that you participate next year! we're going to do it again next year, and i even came up with some ideas to make it an even better experience and contribute more to the cause. and we're going to try to find a couple nights to go look at christmas lights with my family in our two favorite neighborhoods. i guess it's okay that this christmas is a little bit different. it can still be fun and special. if nothing else, it's reiterating the fact that i need to be forgiving of myself when i can't do every single thing i'd like to do. it's something i'm slowly learning and slowly getting better at. look what gretel did to one of my gloves! that's right - she ate it. even though christmastime at the mall can be PURE INSANITY, i still love it. ...as long as i can find a quiet corner away from all the crazy shoppers who like to either run me down or walk 0.000000000000005 miles per hour in front of me. ....and enjoyed each other's company.